Opinion: April 23, 2018 at 1:53p.m. Mitchell of Warren measured up to the best guests last July when she was interviewed about drug issues in the Mahoning Valley. She shared how 4 in 10 applicants for her family business, Warren Fabricating and Machining in Hubbard, could not be hired because they failed drug tests. The CNN appearance was simultaneous with a New York Times article on the same topic. For both stories, Mitchell, 47, was “Shark Tank”-powerful and poised as she dissected the ravages of the opioid epidemic on our community and her family business that employs more than 150. What you could not guess from those stories is that at one time, Mitchell, too, would have failed her own company drug test. “I was living a lie. I was just not living right,” she said. Her first addiction was alcohol in the 1990s. Mitchell, however, recalled she was functional and successful. After college, she started in her father John Rebhan’s business of selling steel. In addition to Warren Fab, they also own Ohio Steel Sheet and Plate. As the companies progressed through the 1990s, Mitchell overhauled quality-control operations. She became manager in 2005. She succeeded in an especially tough environment for a female executive in a steel manufacturing company – while an alcohol addict. She worked the shop floor for 10-plus years. In addition, she was a single mom of three. She was successful – at least as viewed from the outside. It got worse. Her addiction escalated to drugs around 2003. “I remember being tired all the time,” she said. Failing for family weighed on her. Hers was a slow reduction of life that people who see one another every day can often notice first. The last day is seared in her soul. For her daughter’s first day of first grade, she promised to braid her hair the night before. Instead, Mitchell went out. When she got home, there was a note on the kitchen table from her 6-year-old daughter. For Mitchell’s mom, Susan, the family had enough. Mitchell has been clean since 2005. She spent time in a renowned rehabilitation center, then enrolled locally in a 12-step recovery program. Future challenges would demand it. In 2008, her dad died. She and her brother, Eric Rebhan, had to figure out the businesses. Mitchell would become president, and they made it work – very well. In midst of a successful era for both her company and her family, Mitchell quit this past October. Officially, she “retired.” Her brother took over full control, and Mitchell just retains an ownership share. But instead of taking her money to a nice coastal resort, she took it to Roots-town. She put her money and her heart into her history: recovery. 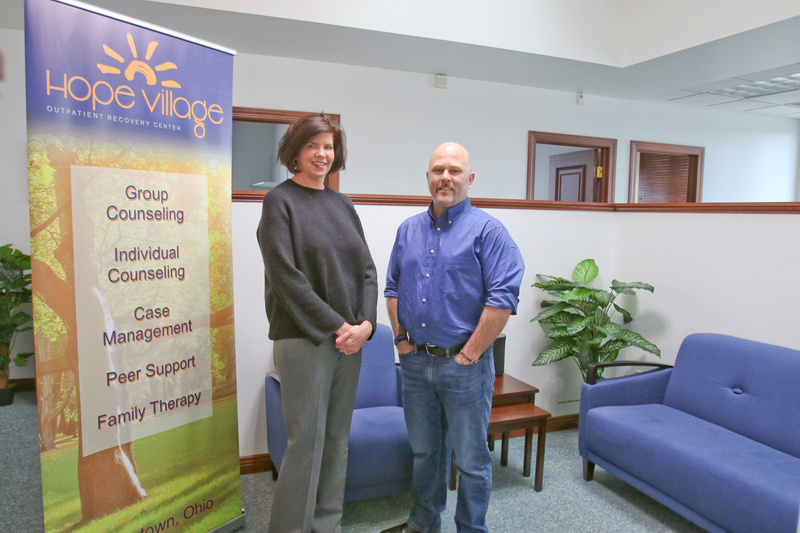 She and partner Ted St. John founded Hope Village Outpatient Recovery Center last winter. Hope will be an outpatient addiction-treatment center with room to treat 60 clients. On Monday, they open for business in Portage County with a full-time staff of eight. If this works, there will be more staff and more facilities in Ohio. She is in control as she showcases the Hope site. It’s a comfortable suburban office building. Everything is precise and in order, from her conversation, to her off-topic chatter, to her desk, to her perfect jar of candy. St. John and colleagues had pursued an idea for a new kind of treatment. He’s a veteran of other Mahoning Valley centers, and knew that Portage County needed services. The group talked with Mitchell just for ideas, originally. “I wanted to help, but had always said Warren Fab will be first for me. Then one day I said to them, ‘I think I want to get involved on a daily basis,’” Mitchell said. While she felt fulfilled at the family business, she also had encountered substance issues with her employees. The boss-worker wall, however, kept her from helping them in the way she’d like. She was all-in at Hope. She’s committed to Hope being different than current facilities. “I don’t want to do what others are doing. I want to do something better, more effective,” she said. She doesn’t criticize other groups. That’s endearing about her style. But she also doesn’t apologize for saying she will find a better way. “I’m an innovator; I’m not an inventor. I’ll take a process that isn’t working, and I’ll work around it until I can make it better. Maybe we can do things differently here and have better outcomes. That we’re not doing what everyone else is doing makes it exciting for me,” she said. Speaking from experience, she said addiction treatment has a unique challenge for corporate executives. At one Alcoholics Anonymous gathering, a person walked up to her excited to meet her in person. It was a Warren Fab vendor. Another time she headed into an AA meeting, she noticed two company employees in the back row. She walked out of that meeting. Running a company successfully was jeopardized by being in addiction treatment, she felt. She also felt more comfortable when addiction gatherings were mainly with women. She wants that to be part of Hope, as well as family sessions to help the supporters understand addiction. “I’m grateful for what I had. But the purpose behind what I’m doing now is really truly my purpose [in life],” Mitchell said. While she’s decided to be a boss for addiction recovery, it is just recently that she decided to also be a face for it. “There’s a callousness now toward addiction,” she said. “We live in a culture that aggravates it. I’d like to replace the addiction culture with a recovering culture. There’s more of us functioning in society than we know. If more of us came out and said ‘Look at us,’ then [people] would look at addiction less callously,” she said. Last Wednesday was an open house for the Roots-town facility – just around the corner from Northeast Ohio Medical University. About 30 or so friends, family and guests filled the facility. Mom was there, too, because a mother always loves her child. As the group made its way through the facility to the front door for a grand photo, Susan made sure to point out that this story — Regina’s story — is a good story for people to know. Todd Franko is editor of The Vindicator. He likes e-mails about stories and our newspaper. Email him at tfranko@vindy.com. Tweet him, too, at @tfranko. April 22, 2018 12:01 a.m.
April 26, 2015 12:01 a.m.
May 13, 2010 4:03 a.m.
April 24, 2015 10:55 p.m.
April 11, 2015 11:05 p.m.